New and Improved V2 version with updated controls and easier balancing! 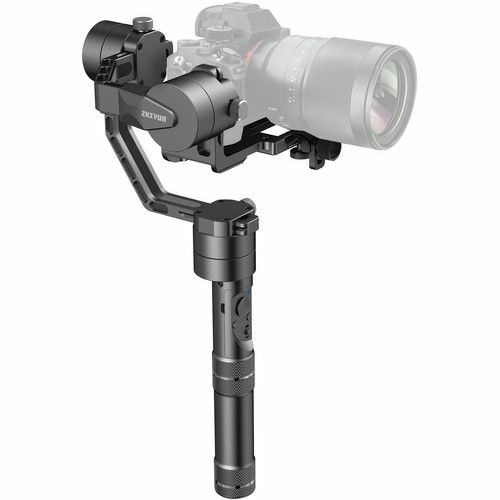 The Zhiyun-Tech Crane is a 3-axis handheld gimbal stabilizer offering 360° rotation along all three axes. It offers button-powered, continuous rotation along the pan axis, and manual, non-stop circular rotation along the tilt and roll axes. The Crane is designed primarily for compact mirrorless cameras weighing up to 2.65 lb, such as the Sony a7S and Panasonic GH4, and includes an attachable lens support for long lenses. The Crane features three 32-bit MCUs (motor control units) running in parallel at 4000 Hz, and has a stepless joystick at your fingertips that allows switching between different modes. Cameras attach by securing a simple thumbscrew without any tools, and full setup can be achieved within a minute. A 1/4"-20 threaded mounting hole on the bottom also allows use with monopods and various other support equipment. The Crane can also be controlled wirelessly from an iOS/Android app (available from Zhiyun-Tech) via a built-in Bluetooth connection to your phone. The Crane supports two different batteries (models 18650 and 26650, which provide 6 and 12 hour runtimes, respectively), and comes with a set of 6-hour batteries and charger, USB cable, and other accessories.